His debut recording, JC On The Set, released in Japan when Carter was a mere 23 years old, heralded the arrival of a significant and powerful new musical force in jazz. Recorded at the same session as his debut, Carter's next release, Jurassic Classics (1994), found him entering the Top Jazz Albums chart for the first time. It was a feat to be echoed with four of Carter's subsequent releases: The Real Quiet Storm (1995), Conversin' With The Elders (1996), In Carterian Fashion (1998), and Chasin' The Gypsy (2000). Gardenias For Lady Day is the first James Carter collection since the simultaneous release, in June 2000, of Layin' In The Cut, an electric jazz/funk collective jam session, and Chasin' The Gypsy, an homage to Django Reinhardt. 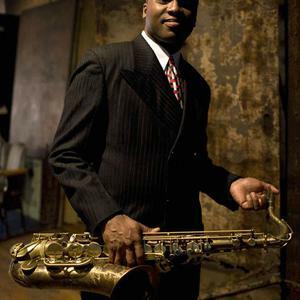 In a review of those two albums, Rolling Stone (August 3, 2000) asserted that "....saxophonist James Carter is as near as jazz gets nowadays to a Young Turk -- not some ironically avant-post-rock experimentalist but a cocky scene stealer with...a knack for coming up with noticeable records." Carter has performed, either live or in the studio, with the Lincoln Center Jazz Orchestra, the late Julius Hemphill, Ronald Shannon Jackson, the Charles Mingus Big Band, soprano Kathleen Battle, Aretha Franklin, David Murray, the Art Ensemble of Chicago, Ginger Baker, Sonny Rollins, and many others. He appeared in the 1994 PBS telecast of "Live At Lincoln Center" and portrayed saxophonist Ben Webster in Robert Altman's 1996 film, "Kansas City." James Carter recently topped Downbeat's annual Critics Poll in the Baritone Saxophone category for the third year in a row. Copyright ? 2003 Sony Music Entertainment Inc.